Exciting news came at the end of the year for Gary Schwitzer’s Health News Review project which had lost the funding that supported the team of reviewers that analyzed the accuracy of health stories in the news and published their findings. HNR was awarded a two-year, $1.3 million grant from the Laura and John Arnold Foundation to continue and expand its work, which will now be housed in the new Center for Media Communication and Health in the U of Minnesota School of Public Health. How often do benefits occur? Is this really a new approach? Is it available to me? Do they have a conflict of interest? 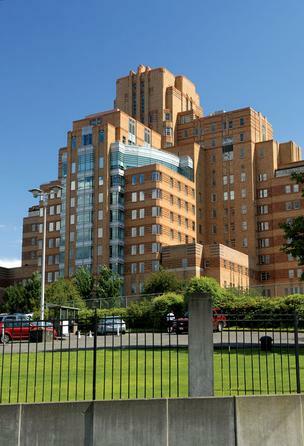 Old US Public Health Service Hospital (known as Pacific Tower during its tenure as Amazon HQ building) to become new satellite campus for allied health professions programs of Seattle Central Community College and serve as site for public agencies and NGOs. In June the King County Board of Health unanimously approved creation of drug take-back system for county residents , to be financed by a 2-cent per Rx tax. On Dec. 1, PhRMA filed a lawsuit against King County , claiming that the plan causes a financial burden for patients and that in-home disposal of medicines is the best way to keep Rx drugs out of the wrong hands. Opinion: Why are Washington’s nonprofit health insurers sitting on huge surpluses? [Washington] State Insurance Commissioner Mike Kreidler has fined Regence BlueShield $100,000 for denying contraceptive coverage to 984 women. Regence had covered the women’s use of an IUD, or intrauterine contraceptive device, but not the removal of it. When the women wanted to remove the device because it was outdated, or because they wanted to get pregnant, the insurance giant did not consider those reasons as “medically necessary,” state officials said Monday. “There’s an important lesson here,” Kreidler said in a statement. He said one woman’s call to his office resulted in coverage for nearly a thousand other women who were denied coverage over the span of eight years. Five tobacco companies have filed suit against the U.S. government claiming that government-ordered graphic warning labels on cigarette packs violate their First Amendment rights. Starting on Sept. 22, 2012, cigarettes sold in the U.S. will have to carry graphic images warning of the dangers of smoking. These images include a tracheotomy hole, rotting teeth, diseased lungs, and a body on an autopsy table. The images will be accompanied by dissuasive wording on cigarettes and smoking, including “cigarettes are addictive,” “cigarettes cause cancer,” and “smoking can kill you.” They must be displayed on at least half of the front and back of cigarette packs, and 20% of the top of the pack. The lawsuit was filed by four of the nation’s largest tobacco companies — including R.J. Reynolds Tobacco and Lorillard, and one smaller company (Sante Fe Natural Tobacco Company) — against the FDA and the Department of Health and Human Services. The companies are seeking to prevent enforcement of the images, arguing that the government cannot legally force them to espouse an anti-smoking advocacy message…. This is yet another area of health promotion in which the US has long fallen short. Graphic warning labels on cigarette packs have been used in Canada since 2001, and dozens of other countries have followed suit. Madigan Army Medical Center surgeon Michael Eisenhauer says his military career foundered as he exposed cozy dealings between an Army doctor and a medical-equipment manufacturer. His whistle-blowing helped lead to the criminal conviction of one doctor; but Eisenhauer is still fighting to clear his own name. Eisenhauer detailed a cozy relationship between the medical-equipment manufacturer Boston Scientific and two Madigan cardiologists, who insisted on sole-source purchases of that company’s implant devices. The long-standing practice of drug companies and medical-equipment manufacturers offering doctors free trips, speaking honorariums and other payments is controversial. Critics say the money may often represent kickbacks for favoring a company’s drugs or devices. Still, in civilian practices such payments are generally considered legal. In the military, however, doctors are prohibited from taking such payments. “Military doctors must owe their allegiance to the soldiers and families they treat — not to drug companies or makers of medical devices,” said U.S. Attorney Jenny Durkan in a statement announcing the plea deal reached with Davis.